This informative guide is a county-by-county directory to Arizona's placer gold. 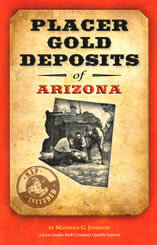 Book comes with a large 20" x 20" map showing reported locations of placer gold deposits in Arizona. A 5.5" x 8.5" paperback with 103 pages.